Get a custom tailored WordPress site, designed exclusively for you, which will look great on mobile, tablet or desktop. My WordPress developer Dublin based studio can provide WordPress theme design completely tailored to your business needs. As a WordPress developer I implement solutions from scratch and never try to bend a template around your business model. What is WordPress I hear you say? 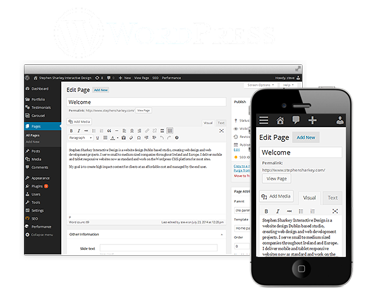 WordPress is an open source online content creation tool. To put it simply, its the easiest way to develop content for your website without all the technical know how and headaches. Each WordPress web design project is unique and tailored to your needs so as to reflect your business image. This is done through a comprehensive review of your business activities and future goals. Looking good is important too, whether its on mobile, tablet or large screen. Thats why I use the latest mobile responsive frameworks available today to achieve this objective. Once built, you will have a WordPress Content Management System or CMS that will enable you to handle your website without the need for a WordPress developer.